Boyfriend Cardigan is rated 4.6 out of 5 by 56. 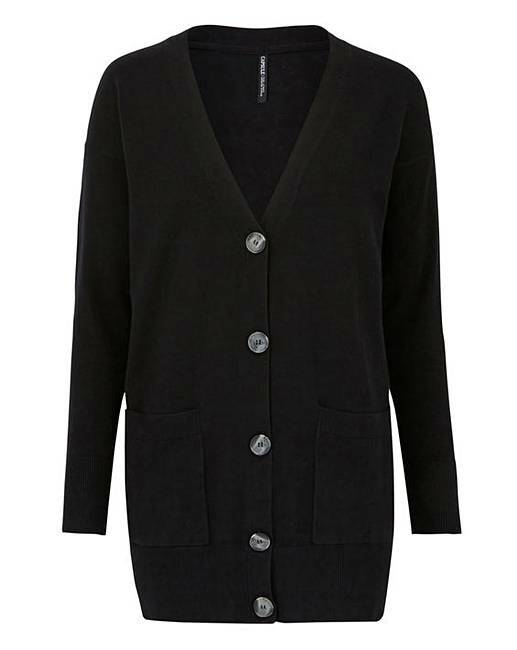 This longline boyfriend cardigan is a staple piece for your transitional wardrobe. Featuring two front pockets and button down fastening for practicality. Pair with jeans and a T-shirt for a great, everyday look. Rated 5 out of 5 by Debby70 from Black cardi Love this, loose fitting, comfy but looks smart, so can wear it for a multitude of events. Washes really well without loosing shape. Rated 5 out of 5 by Peppa from Very comfy Good fit and good quality. I wanted a long thin cardigan and this was perfect. Rated 5 out of 5 by Cazza from Great cardigan Bought 2 of these as part of my uniform for work. Good length, smart, warm and great quality. Rated 1 out of 5 by Fusspot from Disappointing I ordered and received this cardigan. Took it out of the wrappers only to see they are 3/4 sleeves which isn't mentioned nor does it look as if they are in picture. Surely as not detailed correctly I should have delivery charge back as not stated. Do I order another one, with the hope it's full length or ignore it altogether..